Sean started his musical career playing the bass in the school orchestra, converting to guitar in his teens he played and still plays with blues, rock and acoustic acts, while also recording music. Sean was one of the first graduates of DIT’s honours degree in Commercial Modern Music, specialising in performance and education. 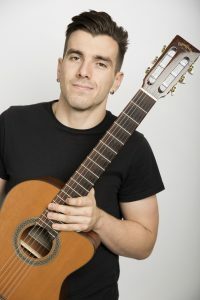 He has been teaching guitar for 5 years, putting an emphasis the importance of theory and written music as part of the learning the guitar.